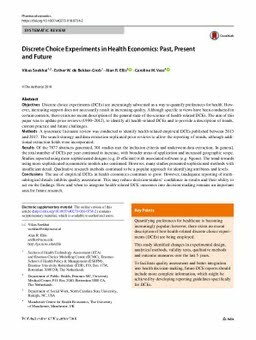 Objectives: Discrete choice experiments (DCEs) are increasingly advocated as a way to quantify preferences for health. However, increasing support does not necessarily result in increasing quality. Although specific reviews have been conducted in certain contexts, there exists no recent description of the general state of the science of health-related DCEs. The aim of this paper was to update prior reviews (1990–2012), to identify all health-related DCEs and to provide a description of trends, current practice and future challenges. Methods: A systematic literature review was conducted to identify health-related empirical DCEs published between 2013 and 2017. The search strategy and data extraction replicated prior reviews to allow the reporting of trends, although additional extraction fields were incorporated. Results: Of the 7877 abstracts generated, 301 studies met the inclusion criteria and underwent data extraction. In general, the total number of DCEs per year continued to increase, with broader areas of application and increased geographic scope. Studies reported using more sophisticated designs (e.g. D-efficient) with associated software (e.g. Ngene). The trend towards using more sophisticated econometric models also continued. However, many studies presented sophisticated methods with insufficient detail. Qualitative research methods continued to be a popular approach for identifying attributes and levels. Conclusions: The use of empirical DCEs in health economics continues to grow. However, inadequate reporting of methodological details inhibits quality assessment. This may reduce decision-makers’ confidence in results and their ability to act on the findings. How and when to integrate health-related DCE outcomes into decision-making remains an important area for future research.